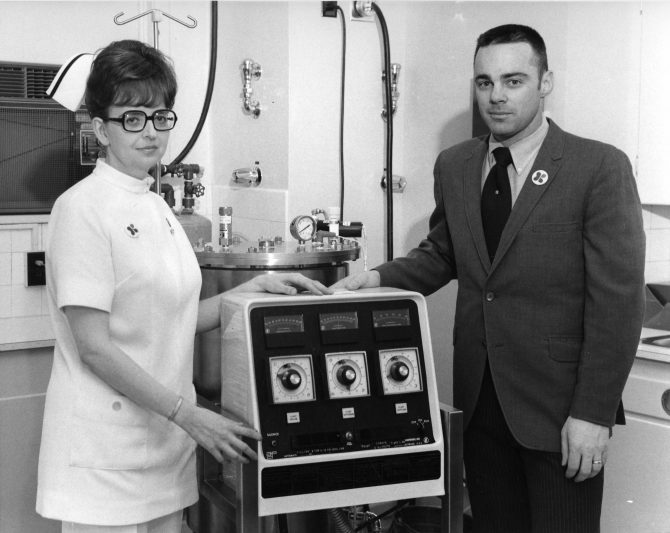 Dolores Knight, supervisor of the intensive care unit at St. Joseph Hospital and Dr. John A. Kennedy, chairman of the board of trustees for the Pierce County Chapter of the Northwest Kidney Fund, stand next to a small peritoneal dialysis to publicize the 1972 Kidney Fund drive. The 1972 Kidney Fund drive would run from February 15 to April 15th with the hopes of raising $25,000 for kidney dialysis treatment or kidney transplants. Each dollar contributed would provide two hours of time on kidney dialysis machines.